We are moving to FL in a couple of months, so I have been weening down the closets before we leave. I :gulp: have decided to Thrift Store anything that won't fit now or in the winter for my 3 dds. I had been keeping all the clothes to pass down from one child to the next. Other than the super nice Christmas dresses, everything else is going or being repurposed. So before going into the give away box, I have been eyeballing each item for its repurposing prospects. Here are two skirts that I repurposed; one from a dress and one from an overall dress. DD#2 had outgrown them, and before repurposing they wouldn't have fit DD#3 for at least 2 years. This was a bib overall dress: (I don't have an embroidery machine yet I took the embroidery from the bib portion and made it into the pocket and cut the dress into a skirt. Too cute!! They look like that is what the were supposed to be! She is SOOOOOO picky sometimes! She is a very slender tall 6 yr old and hates "poofy" things. So the thrift store gets that one. Oh well! Soooo cute!!! I have a huge pile of clothes that I'm going to "repurpose" one of these days. I'm currently making myself a dark khaki green corduroy skirt from a pair of pants my hubby decided he didn't like shortly after purchasing. Since he paid about $150 for them, it has taken me more than a year to get up the nerve to chop them up. At this point I just have the pieces cut out and since he is so much bigger than me it was fairly easy to get the pattern pieces in. I've positioned the pattern so I can use the front and back pockets and just make a new front fly. Maybe finish today??? The teachers in BC are on strike so my kindergartener is not giving me time and my almost two year old gets into more mishchief when her sister is home. forgot to say that there is enough fabric to make a skirt for my girls too. The funny thing is that she is very girly. She loves to wear loads of play jewelry, only wears skirts, and wore a tiara to summer camp daily!!! Whereas, her older sister who likes twirly skirts, is a tomboy. She is the quarterback for recess football games she plays (as the only girl) with her boy friends at school, and wears pants on all her football playing days. 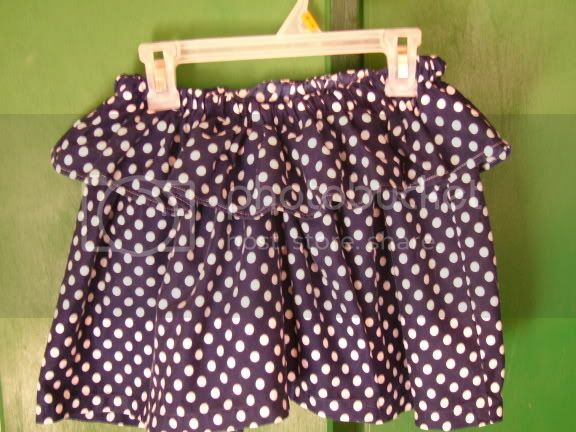 Utterly confusing her classmates by donning a very twirly skirt on occasion. Lol! Kids! What an awesome repurposing! I love it when I can get more than one new garment at a time! Please share pics of your skirts. Thanks for the sweet compliment. I can't wait until next year when I get my embroidery machine. 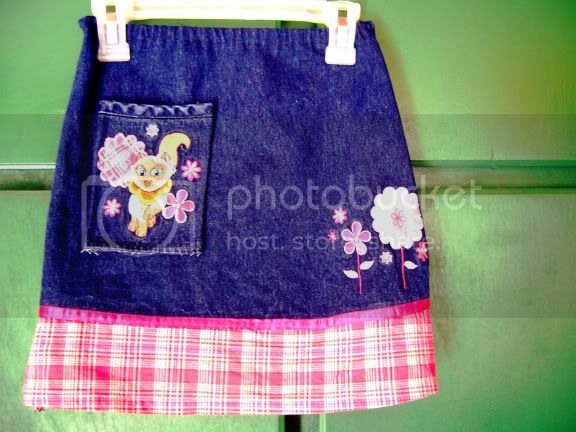 Then I can make cute skirts like this from "scratch". Really cute skirts! I haven't repurposed anything yet, I am too lazy I think. Before, even if I made something and I didn't fit it properly and didn't like it, then rather than remake it the right way, I'd garbage it. Not very thrifty of me at all. I really like the way you used the embroidery from the first piece for the 2nd. And may I also say how brave of you and the family to move clear across the country! Wow, what a huge move for you. Have you found a place to live in Florida yet? When exactly do you move? How long have you lived in California? Sorry to be such a snoop but it's such a big move. We don't have a home in FL yet. My dh is driving out there in his personal car to begin work the first week of November. We are finishing up on our house here to get it "market ready". We hope to place it up for sale within the next 2 weeks or so. Then once it is sold, the plan is to buy a 19' travel trailer and take our 3 dd and our 2 saint bernards there pulling it with our truck. We do have a realtor in FL, and he says that we can make offers on homes there contingent upon the sale of our home here once it is in escrow. Hopefully, my dh will have bid on a home before we leave here, and we will only have to live in the trailer for a short time. It will be convenient to have on hand for hurricane evacuations, though. I'm excited, but nervous too. Other than our move to Germany which happened 2 weeks after we were married (dh was in the Airforce), this will be our biggest move. And the only one which we have had a home to sell. It almost sounds like hubby will be there and you will be back in CA doing the packing and moving! How exciting for you to be moving. We made a major move 4 years ago 1/3 way across Canada and it was just me and hubby. No kids, no pets, and it was a major event. I moved 6 months before him as I had a job so he was left to sell the house, clean out the junk, pack and then I flew back so we could drive out with everything. I'm amazed we didn't attempt to murder each other by the time we were done. We moved into an apartment for 3 months then had to buy a house cause we couldn't stand being so cramped. He has tons of garage/mechanic/welding stuff and it was all in storage. But moving is still exciting, its a fresh start. I'm sure you will love being in Florida. Are the girls excited too? I guess it would be kind of scary for them having to make new friends, new schools etc.